Zinedine Zidane name €200m Atletico Madrid superstar as first signing if he take charge at Man Utd. Amid ongoing reports linking Zinedine Zidane with the Man Utd job, the former Real Madrid boss has reportedly told the club the player he would first like to sign and that’s Antoine Griezmann. According to The Express, Zidane is believed to have already given the green light to take charge at Old Trafford, provided the current coach Jose Mourinho departs. The Portuguese coach came under pressure before the international break following a back to back defeat to Brighton and Tottenham, but the Red Devils bounced back with a win at Burnley in their last and the coach will like to see that as a turning point in their season. 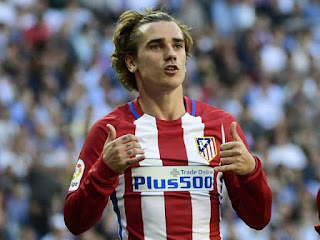 With this, the reports Zidane’s potential arrival at Man Utd still lingering around, and in a report credited to AS, via Le 10Sport, Atletico Madrid’s striker Griezmann has been singled out by the former Real Madrid boss as his first signing for the United if he takes the job. It was revealed further that the World Cup winner could cast a whooping €200m according to his release clause, and that will be an expensive first signing for the Frenchman if he get the job. Griezmann snubbed a move to his current club rivals, Barcelona in the summer while by claiming that he is very much at home at Atletico Madrid, and according to Sky Sports, it seems unlikely then that the France international will consider leaving in less than a year later. Nevertheless, there could be a game-changing appointment for the player to work under his legendary countryman with Zidane potentially taking charge at Man Utd.